Gary Allen, Race Director of the Mount Desert Island Marathon, receives a sponsorship check from Lisa Parsons and Steve Gurin of Bar Harbor Bank & Trust for the 17th annual event scheduled for Sunday, October 14, 2018. 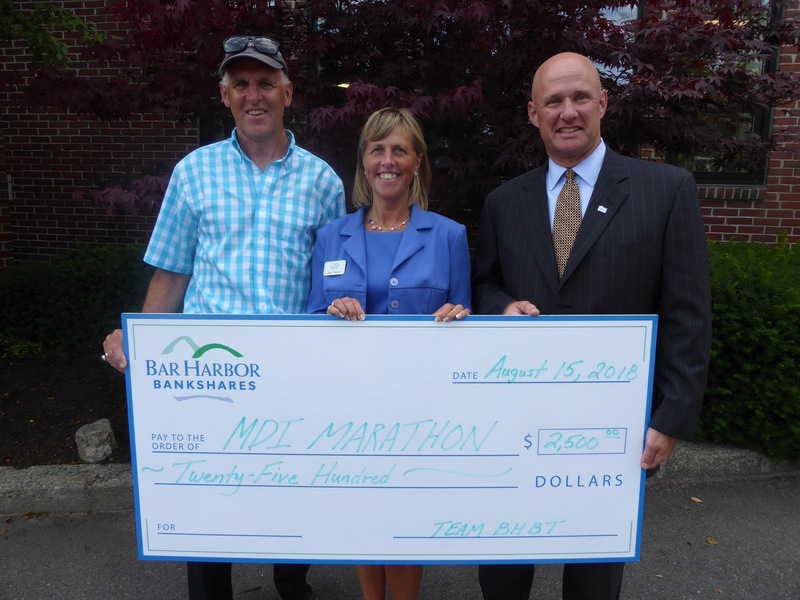 The race starts in Bar Harbor and finishes in Southwest Harbor, passing all four of Bar Harbor Bank & Trust’s branches on Mount Desert Island. This year 2,000 race participants are expected, which will bring many to Mount Desert Island as the summer season wanes. Andrew Simon, co-founder of the Barn Arts Collective. Mount Desert Island Historical Society. 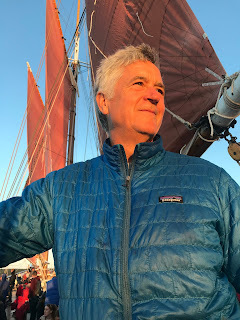 As the Sea Princess cruises through Somes Sound and the Great Harbor of Mount Desert Island, Tim Garrity, Executive Director of the MDI Historical Society, will team with Andrew Simon, theater-maker and co-founder of the Barn Arts Collective, to bring to life events and people from MDI’s past. The cruise will provide insight into what has for millennia drawn humans and other creatures to this unique island. 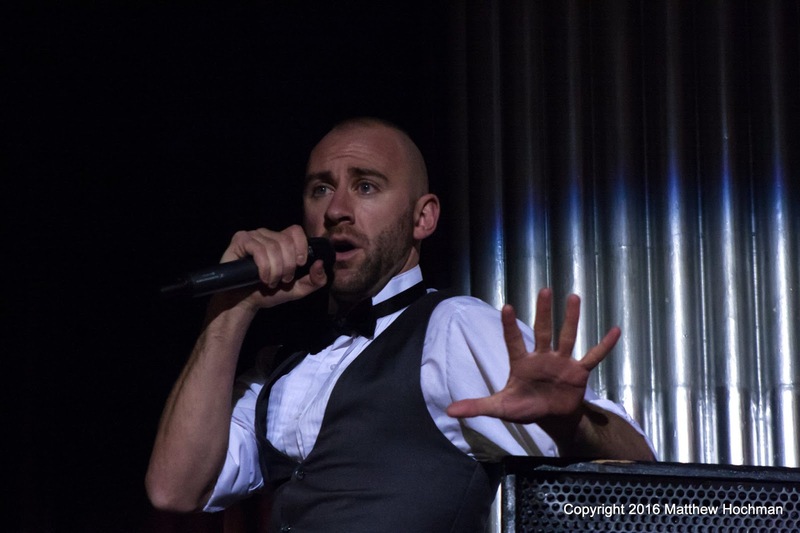 On the cruise Simon will portray figures from history such as Henry Spelman and Jasty McGowan. Spelman was a member of the Champlain Society, the group of 1880s-era college students who studied the natural history of the island. 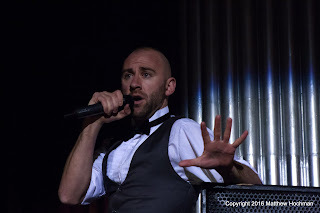 McGowan, a quarry worker, is a character created by Simon for the Historical Society’s Vintage Classroom program, which recreates an 1894 schoolhouse in an immersive performance for local students. The 2-hour cruise will leave Northeast Harbor at 1:15 pm on October 11th. From Northeast Harbor the boat will pass by East Bunker Ledge, Sutton and Cranberry Islands, then venture up Somes Sound with the beauty of the autumn season serving as the backdrop for this informative and creative performance. Tickets are $35. The event is part of Southwest Harbor Week, ten days of tastings, talks, tours, concerts, cruises, and demonstrations hosted by the Southwest Harbor & Tremont Chamber of Commerce. 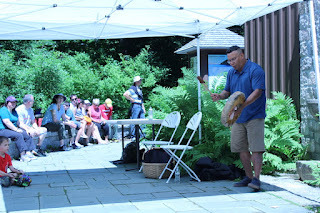 Each day focuses on a different theme that highlights one or more cultural resources on Mount Desert Island. Find a calendar for Southwest Harbor Week and online ticket sales on the Chamber website, AcadiaChamber.com. The Southwest Harbor & Tremont Chamber of Commerce works to promote a vibrant economic community by attracting visitors and connecting them to local businesses. It hosts annual events such as the Fourth of July Fireworks and Acadia’s Oktoberfest. It runs a Visitor Center in Southwest Harbor and the website AcadiaChamber.com, valuable resources for both visitors and residents. The Chamber also seeks to enhance the experience of visitors by publishing trail, cycling, and road maps of MDI and supporting self-guided audio tours. For more information about the Great Harbor Cruise and other Southwest Harbor Week events please contact Cynthia Crow at 207-244-9264 or office@AcadiaChamber.com. This autumn, through a week of walks, cruises, concerts, talks and demonstrations, Southwest Harbor will feature the history and riches of Acadia’s Quietside. The week begins with Acadia’s 23nd Oktoberfest during Columbus Day weekend and ends on Sunday October 14th at the finish line for the 17th running of the MDI Marathon. Each day during the intervening week will highlight one of the area’s cultural resources. Many people don’t realize that Acadia National Park covers nearly half of Mount Desert Island, and that many of the island’s attractions lie near Northeast and Southwest Harbors, often called the “Quietside of Acadia”. SW Harbor Week will shine a light on areas away from the tourist hub of Bar Harbor. Some of the events planned are listed below. Wine tasting at Smuggler’s Den Campground hosted by Sawyers Specialties. Acadia’s Invitational Oktoberfest at Smuggler’s Den featuring music by Banned From Eden and Jones’n the Eclectic Dance Band. Craft fair on the Pemetic Green hosted by the Island Arts Association. Atlantic Brewing Company’s 15th Annual Belt Sander Races & Buffet BBQ. Talks and demonstrations of granite quarrying at the Maine Granite Industry Museum. Guided tours of a local quarry led by Steve Haynes, founder of the museum. Geology walks by geologists Duane and Ruth Braun, authors of Guide to the Geology of Mount Desert Island and Acadia National Park. 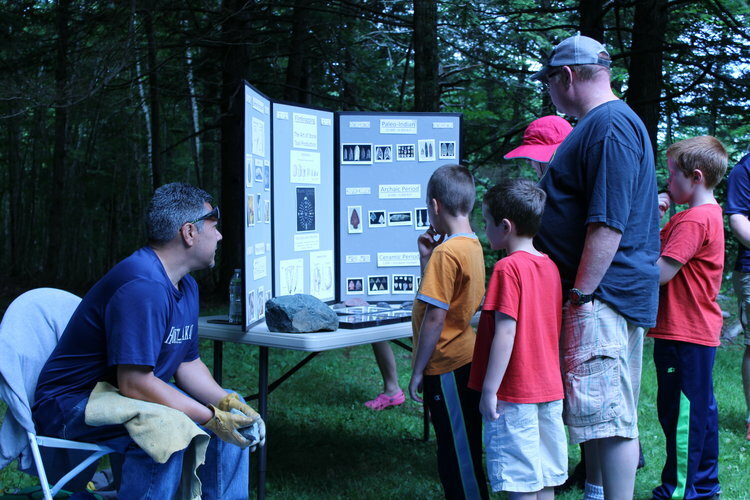 Geology-related art classes at ArtWaves MDI. A workshop on nature journaling using watercolors at the Wendell Gilley Museum. Director’s tour of the Gilley exhibit Earth, Sea, Sky featuring large-scale paintings by artist Barbara Ernst Prey. Guided birding tour into the field with Acadia Birding Festival founder Michael Good. Tour of the Bass Harbor Lighthouse led by Coast Guardsmen. Sunset cruise past Bass Harbor Light with Eli Strauss of Island Cruises. Lighthouse themed art workshops by ArtWaves MDI. History brought to life while cruising on Somes Sound with MDI Historical Society Director Tim Garrity and actors from The Barn Arts Collective. 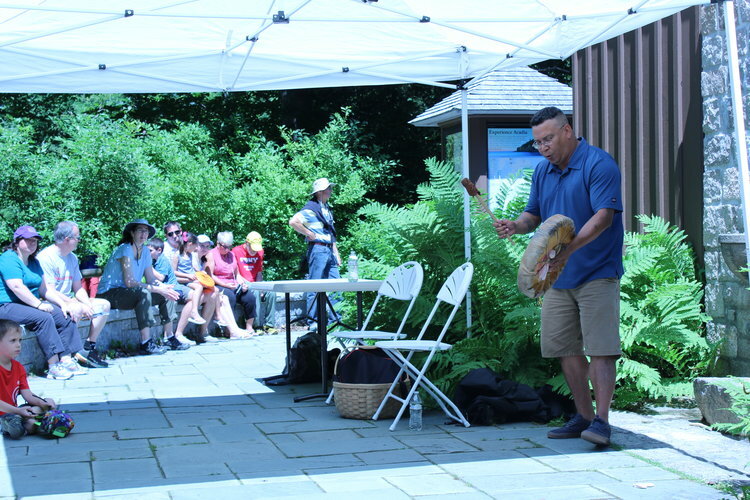 Wabanaki History and Art hosted by the Abbe Museum. Birding cruise on the Elizabeth T with Acadia Birding Festival founder Michael Good. Open house at the Southwest Harbor Coast Guard Station with a tour of the fleet. Tour of a Hinckley Company shop with Hinckley vice president Philip Bennett. Lobstering from a 19th Century sloop led by Sail Acadia founder Karl Brunner. Curator’s tour Art, Advertising and the Automobile at the Seal Cove Auto Museum. Hood ornament carving workshop at the Auto Museum in conjunction with the Wendell Gilley Museum. Exhibition of and rides in early Fords. Events will take place at various venues on Mount Desert Island. Please Visit AcadiaChamber.com for the latest calendar or contact the Chamber office for more information and to purchase tickets.